Originally published under the title, "As ISIS Destroys Ancient Artifacts, Academic Apologist Blames the West for its Desecration of History." 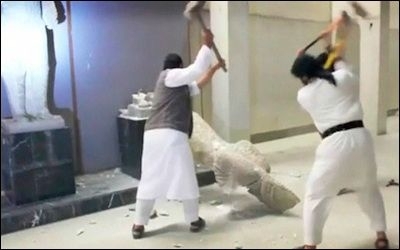 Members of ISIS destroy a statue at Mosul Museum in an undated video released by the group last month. Elliott Colla, associate professor of Arabic studies at Georgetown University, has joined the herd of Middle East studies professors who insist that Islam has nothing to do with widespread destruction of antiquities by the Islamic State (ISIS). Rather than appealing to Islamic texts or traditions to defend Islam, however, Colla deploys a two-fold strategy of feigning ignorance about ISIS and contextualizing their horrific acts within the intellectual and material legacy of Western colonial archaeology. As a result, in whitewashing Islamism Colla degrades the worth of ancient civilizations and their artifacts while training his moral outrage on Western colonialism, particularly the archaeological digs it sponsored and the museums these enterprises filled. What ISIS is doing [sic] the museums and antiquities sites under its control has yet to be verified, much less explained on a local basis. When we know enough about ISIS, we will be in a position to better understand the specific rationale behind their disturbing attacks, but for now, we really do not know very much. [B]ecause there seems to be a doctrinal element to ISIS's practices, it does seem right to think of it as iconoclasm rather than vandalism. The austere Sunni ideology of ISIS (like that of Wahhabi Saudi Arabia) is one that thinks of itself as iconoclastic in the most basic sense of the word. The Prophet Muhammad shattered the idols with his own honorable hands, when he conquered Mecca. The Prophet Muhammad commanded us to shatter and destroy statues. . . . Since Allah commanded us to shatter and destroy these statues, idols, and remains, it is easy for us to obey, and we do not care [what people think], even if this costs billions of dollars. In whitewashing Islamism, Colla degrades the worth of ancient civilizations and their artifacts. By ignoring such clear evidence, Colla is at pains to explain why the Western view of museum artifacts as universally important -- as sacred to everyone, albeit in a secular sense -- is so foreign to those who have been "excluded" not only from Western sensibilities about the past, but the museums themselves. For most of the modern period most of the world's largest museums have been off limits to most people. While institutions like the British Museum relied on state subsidies, they excluded the vast majority of British citizens by way of dress codes, entrance fees or by simply limiting their opening hours to times when most people had to be at jobs…. [T]he Egyptian Museum in Cairo may be located in the bustling heart of Cairo, but it has always catered mainly to the tastes, needs and narratives of European, not Egyptian, visitors…. Could ordinary Egyptians be blamed when, in their struggle to live, they failed to venerate the objects which colonial overlords put on pedestals in halls that were off-limits to them? Nor are they [ISIS] entirely wrong to cry "religion" when they hear absolutist claims about transcendent value, even those made by secularists and self-professed atheists. 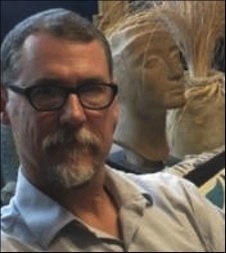 Elliott Colla poses with an antiquity. That uneducated people may view museums and their contents with apathy or even disdain is hardly news. Nor are acts of vandalism against the remains of earlier civilizations. Roman ruins were pilfered for their materials for centuries -- one thinks of the Coliseum's missing façade. But "ordinary Egyptians," along with "ordinary" Iraqis, Syrians, and others, aren't given to storming museums, or the pyramids, or Nimrud, or myriad other antiquities armed with sledge hammers and bulldozers seeking to destroy objects supposedly graced with transcendent value by "colonial overlords" or Westernized rulers. With unintended irony, Colla applies to a new Stalinist-style statue of a tyrant who "modeled himself" on the bloody Soviet dictator the same "transcendent value" accorded antiquities by the colonials he condemns. Weren't such propagandistic works "put on pedestals" (literally in this case) and, in a perverse reversal of being "off-limits to the populace," made the objects of their forced adulation? Applying his concepts to the West, from which they are derived, did the long-suffering citizens of communist nations commit iconoclasm when they took their revenge on their tormentors in the only way most of them could, by toppling statues of Lenin, Stalin, and other glorious heroes of the Revolution? Should the totalitarian regime of North Korea fall, will Colla condemn its starving masses for "toppling the sacred objects of [their] enemies" if they pull down and destroy the monuments to a dynasty of evil men? Colla writes that, "If iconoclasm is a sign of barbarism, and if the appreciation of artifacts is a sign of civilization, we would do well to get our own story straight." Try this: ancient artifacts from any culture are the invaluable patrimony of mankind, while the schlock propaganda of modern dictators -- and those who don't know the difference -- deserve our unreserved contempt. Related Topics: Academia, Middle East studies, Radical Islam | Winfield Myers receive the latest by email: subscribe to the free mef mailing list This text may be reposted or forwarded so long as it is presented as an integral whole with complete and accurate information provided about its author, date, place of publication, and original URL.